CAMECA, a world leader in scientific instrumentation and metrology solutions, is pleased to announce the release of its latest generation atom probe microscope. The LEAP 5000 offers unparalleled 3-dimensional nano-scale surface, bulk and interfacial materials analysis with atom-by-atom identification and accurate spatial positioning. Thanks to these advances along with greatly enhanced ease-of-use and productivity, the LEAP 5000 continues to set the industry standard in providing the ultimate in analytical accuracy, sensitivity, and 3D spatial resolution across a wide variety of metals, semiconductors and insulators. Most importantly, the LEAP 5000 will assist scientists and engineers around the world in accelerating discoveries and developing novel materials, products and devices. Atom Probe Tomography (APT or 3D APT) is the only materials analysis technique offering extensive capability for both 3D imaging and chemical composition measurements at the atomic scale. Since its development in the 1960s, the technique has contributed to major advances in materials science. Exclusively developed and manufactured by CAMECA, LEAP microscopes are used by the most prestigious research and development laboratories around the world, including seven of the ten largest computer chip manufacturers. CAMECA® has more than 60 years of experience in the design, manufacture and servicing of scientific instruments for material micro- and nano-analysis. 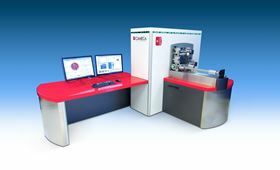 Since pioneering Electron Probe Microanalysis (EPMA) instrumentation in the 1950s and Secondary Ion Mass Spectrometry (SIMS) in the 1960s, CAMECA has remained the undisputed world leader, while achieving numerous breakthrough innovations in such complementary techniques as Low-energy Electron-induced X-ray Emission Spectrometry (LEXES) and Atom Probe Tomography (APT). Headquartered near Paris, CAMECA also has a production facility in Madison WI, USA (where the LEAP APT is designed and manufactured), and further locations in Brazil, China, England, Germany, India, Japan, Korea, and Taiwan. CAMECA is a business unit of the Materials Analysis Division of AMETEK® Inc., a leading global manufacturer of electronic instruments and electromechanical products. This story is reprinted from material from Cameca, with editorial changes made by Materials Today. The views expressed in this article do not necessarily represent those of Elsevier. A novel method uses the tip of a scanning probe microscope to etch nanoscale features on silicon wafers with the need for chemicals or masks. TFP says it will be launching its range of next generation surfacing and adhesive support veils at JEC World, taking place in Paris, France, in March.